In a small saucepan, bring the water, strawberries, and coconut palm sugar to a boil. Turn down the heat and simmer for about 10 minutes, until the strawberries have released their juices and softened, stirring periodically. Remove from heat and allow to cool slightly. Carefully strain the syrup to remove the softened strawberries. I set a colander over a bowl and pour the strawberry syrup through the colander, pressing the strawberries against the sides of the colander with a spatula. Discard the strawberries, or save them for another use, such as topping on waffles. Allow the syrup to cool completely before mixing it into the milk. You should have approximately 3/4 cup of strawberry syrup, and it can be stored in the refrigerator for several days. For every 8-ounce glass of almond milk, mix in 3 tablespoons of strawberry syrup. You can use more or less according to your taste. Add ice, if preferred. 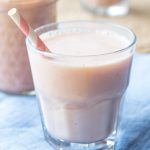 Get this recipe for Vegan Strawberry Milk at https://www.theworktop.com/breakfast-brunch-recipes/vegan-strawberry-milk/.